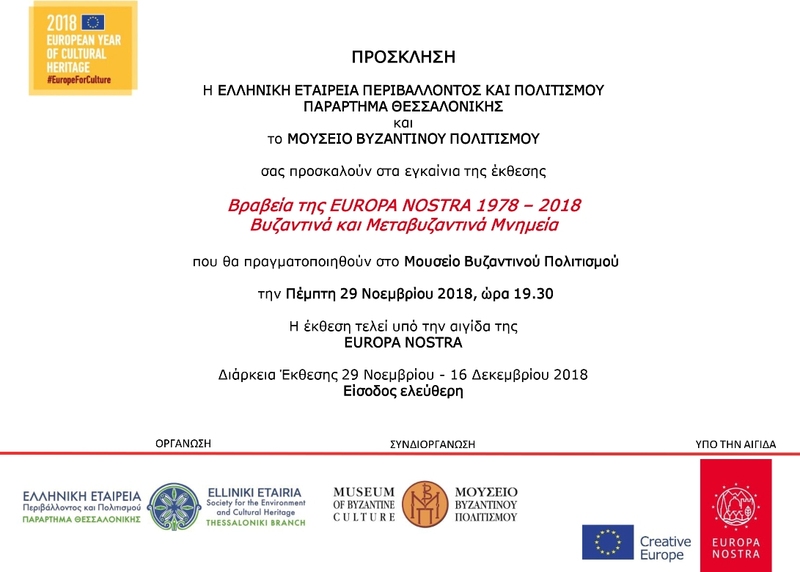 In the context of the celebration of the European Year of Cultural Heritage 2018, the Thessaloniki Branch Office of the Hellenic Society for the Protection of the Environment and Cultural Heritage organizes an exhibition titled “Europa Nostra Awards 1978 - 2018. Byzantine and Post-Byzantine Monuments” in the Eftychia Kourkoutidou-Nikolaidou hall and in the foyer of the Museum of Byzantine Culture. The exhibition, which is held on the occasion of the Fourth International Conference, “Byzantine Monuments and World Heritage IV: Charter for the protection of monuments of the Byzantine heritage”, organized by the European Centre for Byzantine and Post-Byzantine Monuments in Thessaloniki, seeks to emphasize the importance of the Byzantine civilization for Europe’s history and cultural heritage. It also aims at highlighting the role of cultural heritage in historical and artistic knowledge and in the economic and social development of the peoples. Moreover it seeks a dialogue on the importance of quality in protection and restoration. The exhibition includes 22 Byzantine and Post-Byzantine monuments, as well as monuments exhibiting affinities with Byzantine art and architecture as evidence of the radiation of Byzantine culture in a large geographical area. Of these, 12 are in Greece, of which 2 in Thessaloniki, and the rest are situated in Southern Eastern Europe, in other European areas and in the wider region of the Eastern Mediterranean. The exhibition is under the auspices of Europa Nostra, has been incorporated by the Ministry of Culture and Sports into the European Year of Cultural Heritage and is held with the collaboration of the Museum of Byzantine Culture.